We offer the best value in the heart of midtown Manhattan. 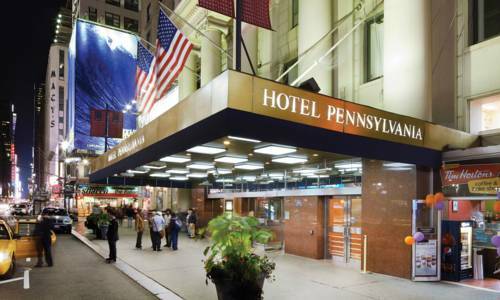 We are perfectly situated across from Pennsylvania Station- minutes from the Empire State Building- Times Square- Theatre District and the Jacob Javits Center. Take advantage of our recently renovated Penn 5000 rooms. You will be impressed with the comfort they provide. We offer the best value and location in the heart of midtown Manhattan. We are perfectly situated across from Amtraks Penn Station minutes from the Empire State Building as well as Times Square- the Theatre District and the Jacob Javits Center. Situated steps from the Hotel Penn front door. Cafe R offers food from all over the world which you can enjoy in buffet form or order and have it freshly prepared for you. Discover New York City dining at its finest within Hotel Pennsylvania at The Statler Grill where you will find delicious and carefully-crafted plates like classic New York steaks and fresh seafood. Whether you are fighting jet lag and need a cup of coffee or looking for a snack before you head up out to explore you will enjoy the perk of having a NYC coffee shop under our roof that is always open.